Picked up this one today, it looked and felt good. All know is it looks like a great copy and seems well made. I used to carry Dixon guitars back in the late '80s. They were a proprietary brand of Scott Music Supply of West Monroe, LA., and were fairly nice guitars. Scott Music was bought up by Davitt & Hanser (now Hanser Holdings) sometime in the 1990s. Same guys as today's Dixon Drums. 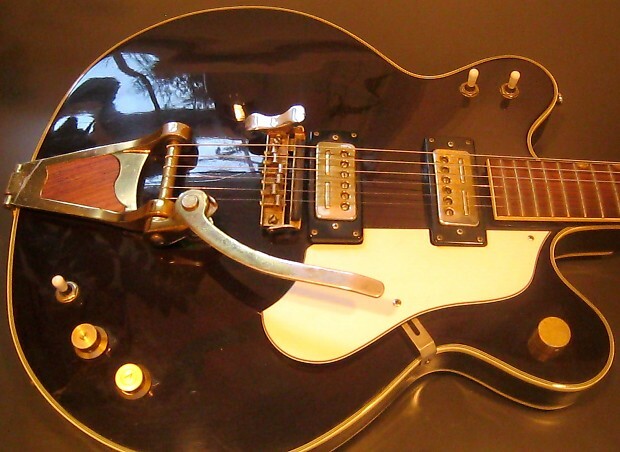 When we carried Dixon, they didn't offer hollowbody electrics like yours pictured above. The design looks a bit familiar. Sounds like this may have been made a couple of decades back, and I’m sure the retail price was a whole lot more attractive than an actual Gretsch Gent (assuming they were even being made by then)... but these days with all the modern Electromatic and Streamliner options it’s easy to get a genuine Gretsch branded guitar for around $600. These knock-offs wouldn’t seem to have a chance in the current market. Those are Matsumoku-built guitars. Some were branded Dixon, other Ventura, Univox, Lyle and others. Some are quite good, others not so much. Thank you, I had a Lyle from the 60s, it was one I sold and wished I still had! Hindsight. None of the Dixons on Ebay or Reverb like this one. A friend had one of the Ventura versions. Very Gretsch-ish. Horribly twisted, bolt-on neck, and the pseudo humbucker pickups were actually single coils in HB cases. Not too impressive. It became "art". My first acoustic was a Dixon dreadnought. Was a nice guitar, wish I still had it. Are you sure about the Matsumoku connection, Parabar? I’ve never seen a bad Matsu guitar - or, personally, a good Dixon. But I never bought any Dixon stuff for the store because it compared very badly with the St Louis Music guitars we were already carrying. Alvarez acoustics (from Kasuga and other Japanese builders) and Electra and Westone electrics (definitely from Matsumoku) were far superior to the Dixons Don showed us. Dramatic difference, like trash to treasure. Since some of y’all are reporting nice Dixons, others are reporting sad ones - and Parabar, you’ve apparently seen both - a hypothesis that fits the evidence is that Scott Music sourced them both from Matsumoku and from less accomplished builders, either serially or simultaneously. Maybe DH simply didn’t buy from the better-quality range, so all that made into my area of central Ohio were low-end Dixons with low standards and worse quality control. They sure didn’t look, feel, or sound like Matsumoku. The only info I even have is from pictures on a google search, they point to 1969 one from Matsumoku. I can't find anything not to like about it, the worksmanship is flawless, the frets are smooth the binding is 7 piece nicely done, the fingernail inlays? Great. If there is a bad thing it would have to be the tremlo, not the best in the world. The bridge is an engineering marvel. Matsumoku built guitars to spec for a variety of distributors. 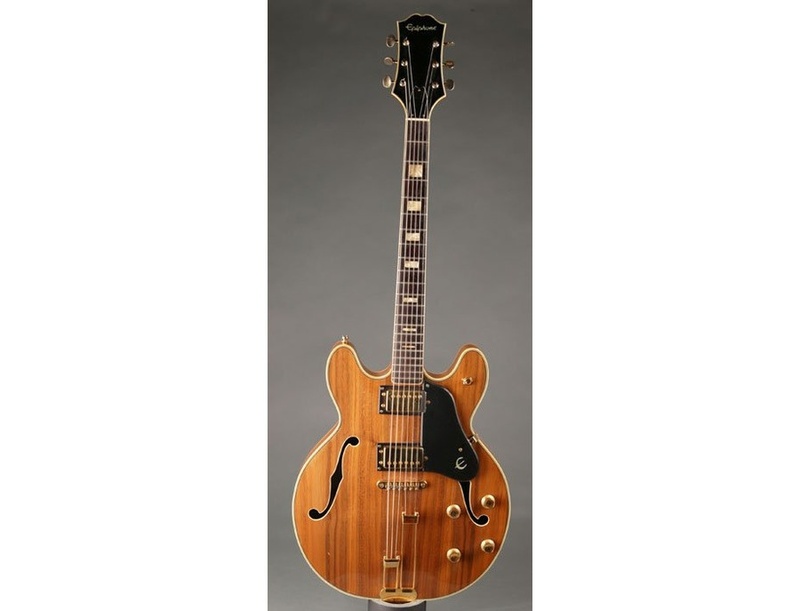 The high end ones were outstanding --- I have a Ventura Barney Kessel that is just great. But they also built guitars that were the absolute embodiment of "cheap Japanese guitar" when that was a derogatory label. 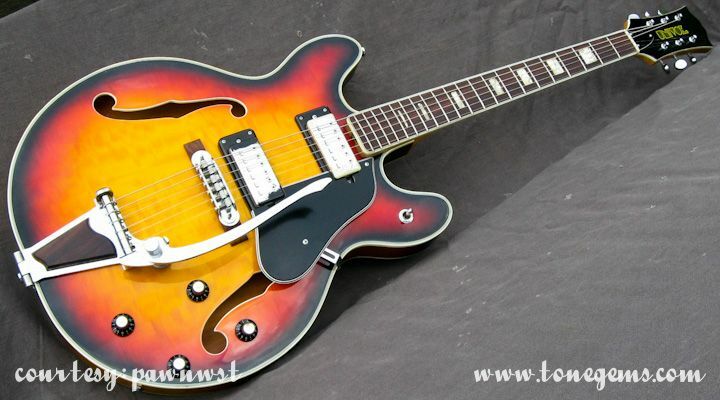 In the late 60's/early 70's, Epiphone outsourced their maufacturing to Matsumoku, and kept the names "Casino," Riviera," etc, --- but the guitars bore no resemblance to what we rightly think of as those models, but were generic cheap guitars ---- some with unplayable action and frets that would never intonate properly. I haven't had a chance to play one of those Matsumoku Gent wannabes to know how good or bad they were, but here's another pic of a Ventura labelled one. The guitarist in my first band in 7th and 8th grade had a Matsumoku Aria like this one. Inexpensive guitars are SO much better nowadays! That one looks like a much later aftermarket replacement. Parabar, I'm most familiar with Matsumoku's output from the late 70s through to their end, when they had apparently moved broadly upscale. I know they built for "everyone," and don't doubt that early on they made low-end when low-end was spec'ed (and ordered at bottom dollar).